ChristineCreations: The Abundance Release Begins! A very happy welcome to each of you stopping by today! Power Poppy has a fabulous week ahead for you with brand new polymer sets created by Marcella Hawley, full of Abundance! There’s so much beauty in store that it’s overflowing. Today we’re kicking it all off with a sweet set called Vibrant Thanks. In it you’ll find three pretty sprigs of summer flowers and some stylish sentiments that make this thank-you set a must-have! Zinnia, Bee Balm and Coreopsis allow for multitudes of combinations with the various sentiments. 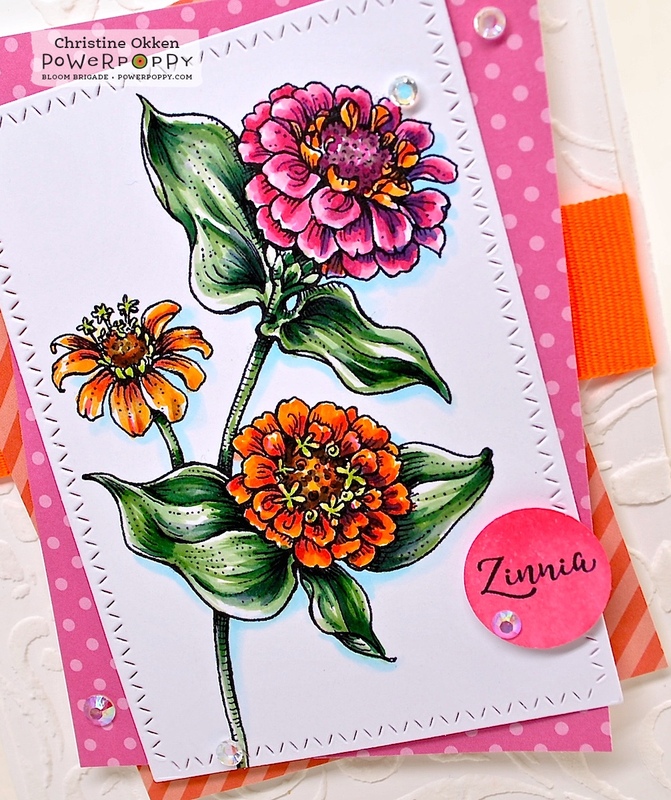 I started off with the pretty zinnias to colour. They are such a great cut flower and you can colour them in SO many different combinations, which is really fun. After colouring this beauty up, I placed it on a couple of pieces of designer paper (MFT) and added a pop of vibrant orange ribbon, layering that over another piece of white cardstock that I used embossing paste and a stencil on to give it some texture. I think those bright colours and the bright white pair well together. A few teeny iridescent jewels finish off the design. Here are the Copics I used....a quick photo taken when I was colouring at my parent’s place. There is so much beauty in store for you today from the rest of the Power Poppy Bloomies...be sure to pop by and leave your love! All this beauty is coming at you each day over the next week, be sure you check back each day! and Marcy and the Power Poppy Blog! So very fresh and gorgeous, Christine!! Oh, Christine, such gorgeousness! I love this sprig of zinnias and your gorgeous colors! And what a beautiful layout with the perfect DP and great layout! Love your amazing coloring...can it be that you get better and better? I think so! Love it, sweet friend! Hugs! This is so pretty, Christine! I love zinnias! Beautiful, Christine! 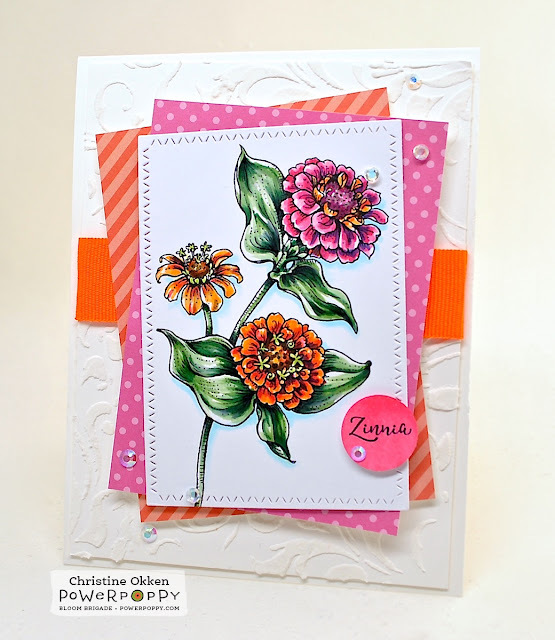 I love your bright zinnias with the pristine white stenciled background! Oh, my! Can't beat those Zinnias for vibrant color, and yours are perfect! I love this set already! Oh Christine, the colors you used are absolutely delicious! Your coloring and layout is pure perfection as well! Love! A perfect card for summer with the bright colors you chose! Awesome coloring! Beautiful colours and colouring. Love how bright it is. Very colorful and vibrant Christine! These zinnia look awesome and I do like the vibrant colors. Beautifully done. Such a happy creation! Thanks for sharing! Fabulous, another gorgeous zinnia card, love your design! I love zinnias because they bloom in so many different colors. So excited to see them being featured. Such a bright and happy card! Love your variety of zinnias!